Derivation and potential applications of bone marrow stroma–derived cardiomyocyte cell lines. 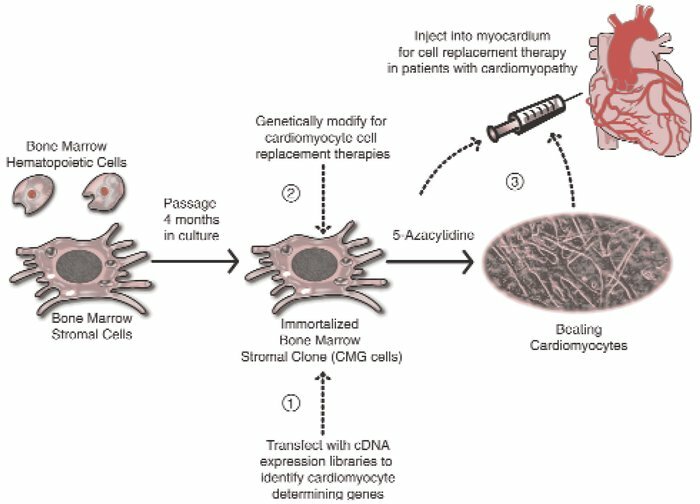 Schematic illustration of the derivation of the CMG bone marrow stroma–derived cardiomyocyte cell line. Solid arrows indicate the work reported by Ogawa and colleagues (4) in this issue of the JCI. Dotted lines show potential applications of the cardiomyocyte cell line in studies designed to identify cardiomyocyte-determining genes (1), or in cell replacement therapies for patients with cardiomyopathy (2, 3).